Jailed and subjected to torturous solitary confinement by the Bush administration in 2010, convicted and sentenced to 35-years of maximum-security confinement by the Obama administration in 2013, Chelsea Manning is widely considered an American hero for risking her own freedom to expose war crimes committed by the United States military in Iraq. From her position as an Army intelligence analyst, Chelsea had access to massive amounts of state secrets. Among the hundreds of thousands of documents she chose to release were troves of State Department cables which revealed US foreign policy duplicity and corruption in governments around the world, some of which contributed to the Arab Spring uprisings of 2011. Historically speaking, Chelsea's leak of classified materials is one of the most significant whistle-blowing actions ever taken in this country, of a scale and importance on par with RAND Corporation employee Daniel Ellsberg's leaking of the Pentagon Papers in 1971, which exposed Department of Defense lies about the Vietnam War. Daniel Ellsberg, in fact, has been a vocal defender of Chelsea since her initial arrest in 2010. Recognizing the sacrifice Chelsea made to expose hidden truths, she has been honored with contingents in Gay Pride parades in San Francisco, Santa Cruz, and elsewhere since her arrest. In 2013, the Manning Contingent won the San Francisco Pride Parade's Best, "Absolutely Fabulous," Overall Contingent Award. In San Francisco, activists of all stripes now refer to Justin Herman Plaza on the Embarcadero as Chelsea Manning Plaza, preferring to pay tribute to Chelsea rather than racist gentrifier Justin Herman. Not until January of this year, as Obama was about to leave office, did he commute Chelsea's sentence — and, finally, on May 17, she was free. 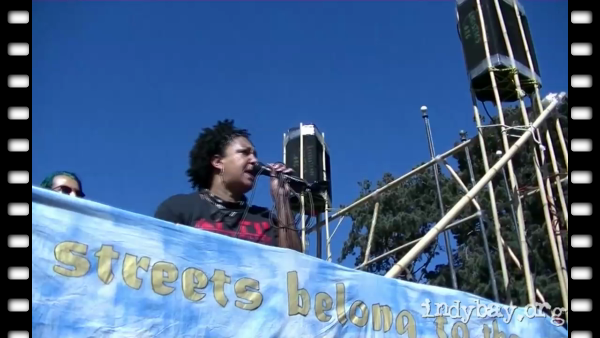 For context, the video begins with Cat Brooks firing up the crowd on the edge of UC Berkeley campus. Rachel Jackson then introduces Chelsea. WikiLeaks Solidarity in SF, Berkeley, Santa Cruz: "Exposing the Truth Is Not a Crime"